Success breeds success, as we have seen from our tournament team. Brad Jones Karate Do is the only Karate dojo in the Newmarket affiliated with Karate Ontario, Karate's official sports governing body in Ontario. Karate Ontario is a members of Karate Canada, which in turn is a member of both the World Karate Federation (WKF) and the Canadian Olympic Committee. 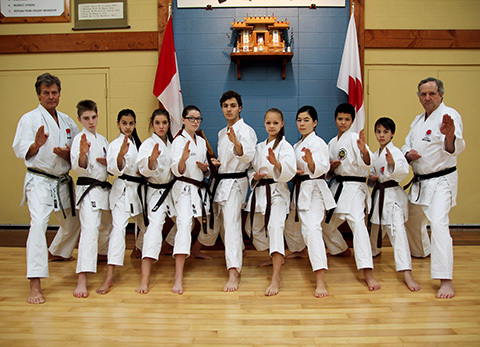 Shotokan Tigers is the dojo's tournament team that has produced many elite athletes who have represented our province at National championships and our country at both World Karate Federation (WKF: Pan Ams and Worlds) and JKA international championships. In October 2014 over 8 competitors will travel to Tokyo, Japan to represent Canada in the the Japan Karate Association's (JKA) World Championships, the Funakoshi Gichin Cup. The tournament team has six coaches. Students start in the recreation group and graduate into the elite team group when they are eligible for the provincial and national teams. Our athlete development program has been very successful and every year we have sent a roster of competitors to nationals. The opportunity to train with other young athletes and compete in tournaments is one of the unique opportunities of training at our Newmarket dojo.